My man and I had a hankering to watch some eighties movies a few weeks ago. I chose The Great Outdoors and he chose Road House with Patrick Swayze. 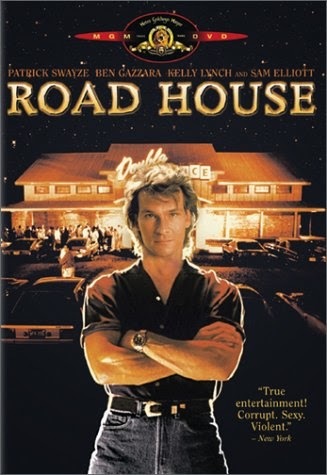 As we were watching Road House, I ironically was identifying with Patrick Swayze's character. In case you don't know, his character is purported to be the best bouncer in the tri-county area. He's a big deal. The big gun. He makes the big money. The part I was identifying with, was the getting punched in the face part and the negotiating with irrational people part. Such is life in the motha-hood. Every single day, I get an awkward elbow to the face, my feet get trampled, my glasses get knocked off. The list goes on and on. Right now, my glasses have only one arm. I am a walking bruise. These tiny people are so emotionally volatile about everything. I have often thought that a professional hostage negotiator should write a book about parenting. If you can stay calm in the face of a man with a machine gun atop a thirty story building, perhaps you could teach me to calm my children. To be honest, my parenting/bouncer skills aren't quite so cool as Patrick Swayze's character. I'm probably the Nacho Libre of mothering. It's a good thing I am so enamored with these tiny females or I might just take all of this abuse personally. Grace and peace to your houses, y'all. P.S. If you are ever in Bastrop, get the Cream Cheese Jalapeño Burger at Road House. It will blow your mind.